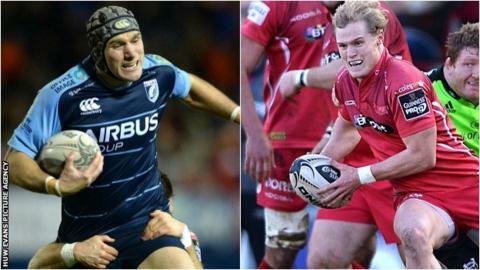 Cardiff Blues wing Tom James and Scarlets scrum-half Aled Davies have been named in Wales' 37-man squad for the 2016 Six Nations. James, 28 has been recalled six years after winning his last cap, while 23-year-old Davies is the only uncapped player included. Backs Liam Williams, Jonathan Davies and Hallam Amos return to the squad following injury. Wales' Six Nations campaign begins away to holders Ireland on 7 February. Blues forward Josh Turnbull is also recalled and Bath fly-half Rhys Priestland is named after reversing a decision to take a break from international rugby. Captain Sam Warburton is included despite not playing since November, while Scarlets full-back Liam Williams' last game was at the 2015 World Cup. Leigh Halfpenny and Scott Williams, as expected, are not included because of injuries while scrum-half Rhys Webb is also an absentee. Webb, 27, has not played since injuring a foot during a World Cup warm-up match against Italy in September and will not return until the end of February. "We have picked a larger squad than normal, we have a few injuries at the moment, those players aren't too far away from getting back on the field so we are happy with the mix," head coach Warren Gatland said. "We have selected a squad that rewards players' form as well as picking a lot of experience and that continuity is important to us. "Aled [Davies] is someone who has been on the radar the last couple of years and his selection is reward for his form. "Tom [James] is playing very well for the Blues and we have been impressed with Josh's [Turnbull] performances recently." James, who won the last of his 10 Wales caps against England in 2010, has scored five tries in 11 appearances for the Blues this season. Aled Davies will provide scrum-half cover for regional team-mate Gareth Davies and Blues' Lloyd Williams following Mike Phillips' retirement from international duty. The squad includes 31 players who featured in the 2015 Rugby World Cup while 10 players are based outside Wales. After the opening game against Ireland in Dublin, Gatland's side host Scotland on Saturday, 13 February and France on Friday, 26 February. England will have the chance to avenge their World Cup defeat when they again host Wales at Twickenham on Saturday, 12 March. Seven days later, Wales' tournament ends against Italy in Cardiff. Wales finished third in the 2016 Six Nations before reaching the World Cup quarter-finals, where they were beaten by South Africa. Forwards: Rob Evans (Scarlets), Paul James (Ospreys), Gethin Jenkins (Cardiff Blues), Tomas Francis (Exeter Chiefs), Aaron Jarvis (Ospreys), Samson Lee (Scarlets), Scott Baldwin (Ospreys), Kristian Dacey (Cardiff Blues), Ken Owens (Scarlets), Jake Ball (Scarlets), Luke Charteris (Racing 92), Bradley Davies (Wasps), Dominic Day (Bath Rugby), Alun Wyn Jones (Ospreys), Josh Turnbull (Cardiff Blues), Taulupe Faletau (Newport Gwent Dragons), James King (Ospreys), Dan Lydiate (Ospreys), Ross Moriarty (Gloucester Rugby), Justin Tipuric (Ospreys), Sam Warburton (Cardiff Blues, captain). Backs: Aled Davies (Scarlets), Gareth Davies (Scarlets), Lloyd Williams (Cardiff Blues) Dan Biggar (Ospreys), Rhys Priestland (Bath Rugby), Cory Allen (Cardiff Blues), Jonathan Davies (Clermont Auvergne), Tyler Morgan (Newport Gwent Dragons), Jamie Roberts (Harlequins), Hallam Amos (Newport Gwent Dragons), Alex Cuthbert (Cardiff Blues), Tom James (Cardiff Blues), George North (Northampton Saints), Gareth Anscombe (Cardiff Blues), Matthew Morgan (Bristol Rugby), Liam Williams (Scarlets). Who was in Wales' World Cup squad? Read more on Who was in Wales' World Cup squad?